This session will review the latest legislation and cases affecting planning and zoning officials, the use of social media to encourage and enhance public participation, land use tools to address the challenges of climate change, zoning tools to promote urban agriculture, getting the most out of your development agreement, and more. You can find out more and register on the APA-CMS website. Recently, a former Northwestern University student filed a lawsuit against Northwestern Memorial Hospital and one of its doctors after a doctor posted on Facebook a picture of the student being treated in the ER for overconsumption of alcohol. The student claims that the hospital and doctor violated the HIPAA Privacy Rule, which protects information about a patient and his or her medical condition and treatment. To read more about the lawsuit, and the importance of training employees about the potential HIPAA issues that can arise in their use of social media, check out Strategically Social: Social Media and the HIPAA Privacy Rule. 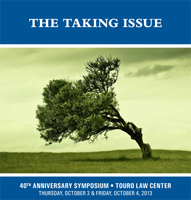 The Touro Law School will present The Taking Issue, the 40th Annual Symposium on takings law on October 3-4, 2013. The conference will be held at the law school in Central Islip, New York, and is co-chaired by Dean Patricia Salkin (Touro), and Professor David Callies (University of Hawaii, William S. Richardson School of Law). The two day event will feature a welcome and introduction by the co-chairs, seven substantive sessions on takings law, a keynote speaker, and a special dedication to Fred Bosselman, who co-authored The Taking Issue in 1973. Sessions include an historical overview of takings law, discussions of U.S. Supreme Court decisions on takings, including Lucas and Nollan/Dolan/Koontz, and a panel on unconstitutional conditions on which Ancel Glink attorney Julie Tappendorf will participate. You can learn more about the event and register on the law school's website. The City of Chicago, like many other municipalities, has enacted vacant property regulations requiring the owners or responsible parties to register vacant properties and buildings with the City and maintain their properties and buildings. The purpose of the vacant property/building registry was to provide a municipality with information about the owner and/or responsible party for a vacant property, and to ensure that these properties were adequately maintained and secured. On Friday, a federal district court judge ruled that Chicago could not enforce its vacant building registry against the Federal Housing Finance Authority (FHFA), the overseer of Fannie Mae and Freddie Mac. Federal Housing Finance Authority v. City of Chicago. The City had enacted its vacant property ordinance in 2011. That ordinance requires owners and lenders to register a building after it becomes vacant, pay a $500 registration fee to the City, and continue to maintain the property. A month after the ordinance was effective, the FHFA filed a lawsuit challenging the ordinance on a variety of grounds, including that the City was preempted from enforcing the municipal ordinance against the federal government and that the registration fees were a tax on federal governments. Those were the two grounds upon which Judge Thomas Durkin relied in ruling against the City and in favor of the FHFA. In his ruling, Judge Durkin also rejected the City's argument that the vacant property ordinance was a local "land use" regulation that was not subject to federal preemption. This ruling could impact municipalities across the state (and country) that have enacted similar vacant building/property registration ordinances. According to the Chicago Tribune, more than 1,000 municipalities have enacted ordinances requiring the registration and maintenance of vacant properties. First, this case did not strike down the City's vacant property ordinance in its entirety. Instead, the decision restricts a municipality's enforcement of this type of ordinance against Fannie Mae and Freddie Mac because of federal preemption limits. Therefore, Chicago can continue to enforce its ordinance against owners of vacant property. Second, Chicago's ordinance was amended in 2011 to specifically require mortgage holders to comply with the registration and other requirements. Prior to that 2011 amendment, only owners were subject to the registration and maintenance obligations. Many vacant property ordinances that were enacted by municipalities other than Chicago are restricted to owners or other title holders. The decision does not affect the enforcement of vacant property regulations against property owners. In light of this decision, municipalities that have vacant property ordinances in place may want to review the scope of those regulations because the FHFA may decide to challenge similar ordinances enacted by other municipalities. A lawyer in Virginia had his law license suspended last month for five years after he advised his client to clean up his Facebook page. The lawyer was representing a plaintiff in a lawsuit brought against a driver who allegedly caused the death of his wife. Shortly after the defense filed discovery requests for screen shots and other information from the plaintiff's Facebook page, the Virginia lawyer instructed his paralegal to tell the client to delete certain photos. The defense lawyers recovered the deleted photos before trial, and the lawyer was brought before the state bar disciplinary board for violation of ethical rules governing candor toward the tribunal, fairness to opposing party and counsel, and misconduct. This post appeared on Julie's other blog, Strategically Social, last week. The Planning and Law Division of the American Planning Association just released its summer 2013 edition of the Planning & Law Newsletter. This edition contains numerous interesting and cutting edge articles and information relating to planning and land use, including an article by Brent Denzin of Ancel Glink titled "Wake of the Flood: Flood Waters, Bloated Budgets, and a Plan to Save Your Community." Other articles include a summary of the recent U.S. Supreme Court decision in Koontz v. St. Johns River Management District, and articles on land banking, form-based codes, and the biofouling problem for the Florida manatee (you will have to read the newsletter to learn what "biofouling" is!). You can access the complete newsletter here. A supermarket sought review of a decision of the town zoning board of adjustment (ZBA) which granted a variance to an ordinance restricting the size of any single building in the commercial district to a competing supermarket developer. The petitioner owns and operates a 36,541 square foot supermarket in a commercial zone where the zoning ordinance limits the size of buildings to 40,000 square feet. Subsequently, a different company sought a variance to build a supermarket in a commercial zone with a size of 78,332 square feet, located 3.8 miles from the petitioner’s property. Although the petitioner participated in the zoning board hearings on the matter, the board denied petitioner’s motion for a rehearing on the grounds that petitioner was not a “person directly affected” by the decision, and thus without “legal standing” to contest the variance. The Superior Court agreed and petitioner appealed to the New Hampshire Supreme Court. On appeal, the Seventh Circuit examined Frey's substantive and procedural due process claims. First, the court determined that Frey waived any argument that a site approval is a land use regulation similar to zoning. The court acknowledged that it was an interesting argument, but did not address its merits because Frey did not raise it previously. Second, the court held that although issuance of a liquor license to the grocery store tenant was a protected property right, the underlying site approval to the shopping center was not because Illinois law is silent on the issue of site approval. Finally, the court held that because there was no protected property interest in the site approval, Frey was not due any notice or procedure prior to revocation. Nevertheless, the court acknowledged that the City provided Frey with adequate notice and an opportunity to be heard prior to the revocation hearing. Although Psychic Sophie was not entitled to First Amendment protection for her business (see yesterday's post), a tattoo parlor in Mesa, Arizona was when a court determined that tattoos are "pure speech" and the process of tattooing is "expressive activity" under the First Amendment. In the City of Mesa, tattoo parlors and other specified businesses must obtain a “Council Use Permit” too operate in the city. The City denied a permit for a tattoo parlor, and the tattoo artists sued arguing, among other things, that the ordinance violated their rights to free speech. The trial court granted the City’s motion to dismiss, but the appellate court reversed, finding that the business of tattooing is entitled to First Amendment protection. On appeal, the Arizona Supreme Court surveyed the divided case law on the subject, and concluded that a tattoo is pure speech, and the process of tattooing is expressive activity for First Amendment purposes, even though the artists may use standard designs and require payment for their services. Coleman v. City of Mesa, 230 Ariz. 352. In other words, “[t]he fact that a tattoo artist may use a standard design or message, such as iconic images of the Virgin de Guadalupe or the words ‘Don't tread on me’ beside a coiled rattlesnake, does not make the resulting tattoo any less expressive.” The artists argued that the ordinance was not a valid time, place, and manner regulation, and the Supreme Court agreed because the permit scheme did not contain adequate standards to guide the Council’s unbridled discretion. Accordingly, the trial court erred in dismissing the tattoo artist’s complaint for failure to state a claim. It is possible for a municipality to regulate fortune tellers without running afoul of the First Amendment's protection of free speech and religion. In Chesterfield County, Virginia, a “fortune teller” engaged in the occupation of “occult services,” including fortune tellers, palmists, astrologists, or other advisor “who in any other manner claims or pretends to tell fortunes or claims or pretends to disclose mental faculties of individuals for any form of compensation.” In addition to the payment of business license fees and other regulations, “occult sciences” are only allowed in select zoning districts by conditional use permit. Rather than pay the required license fee for her spiritual counseling business, Patricia Moore-King (a.k.a “Psychic Sophie”) challenged the County regulatory scheme as a violation of her rights to free speech and free exercise of religion, in addition to her rights under RLUIPA. The District Court granted the County summary judgment, finding the business of predicting future events to be “quintessential deception” entitled to no First Amendment protection. Alternatively, the District Court found the regulation to be permissible regulations of commercial speech, or valid time, place, and manner restrictions. Psychic Sophie appealed, and the Fourth Circuit U.S. Court of Appeals found that fortune telling is entitled to some measure of First Amendment protection because it is not “inherently deceptive” on the basis it involves predictive speech. Moore-King v. County of Chesterfield, Va., 708 F.3d 560 (4th Cir. 2013). Nevertheless, the Court upheld the County's regulations, relying on the “professional speech” doctrine which allows the government to employ generally applicable regulations for those providing services involving speech without running afoul of the First Amendment. The fact that no accrediting institution exists for fortune tellers supports the County’s additional regulatory requirements. Finally, the Court concluded that Psychic Sophie’s collection of beliefs amounted to a “way of life,” rather than a religion entitled to protection under the First Amendment's right to free exercise of religion or RLUIPA. Psychic Sophie continues to practice her "way of life" on psychicsophie.com, where she provides readings via email and Skype, and payment can be made using your paypal account. City had no actual or constructive notice of 2 inch height differential in sidewalk. The Illinois Appellate Court ruled in favor of the City under Section 3-102 of the Tort Immunity Act after determining there was insufficient evidence of either constructive or actual notice to the City of a two inch height difference between two sidewalk slabs where the plaintiff fell and was injured. The Court found the plaintiff failed to meet her burden to provide facts showing the City had notice of the condition that caused her fall with adequate time to have repaired the sidewalk. You can read the E-News in the Resource Center on Ancel Glink's website. Even though the Employer Shared Responsibility provisions of the ACA will not be effective until January 1, 2015, public employers in Illinois are nevertheless concerned about their obligation to provide insurance to full-time employees under that statute. Central to that obligation is the determination of whether the public body is a "large employer" -- that is, one that employs 50 or more full-time and full-time equivalent (FTE) employees. (3) To determine the total number of FTE employees employed by the public body, add the total number of full-time employees in (1) and the number of FTE employees in (2) and divide by 12. If that number is 50 or more, the public body is a large employer. But there is an important exception to that determination - the "seasonal worker" exception. That exception provides that "[i]f the sum of an employer’s full-time employees and FTE’s exceeds 50 for 120 days or less (four calendar months or less) during the preceding calendar year, and the employees in excess of 50 who were employed during that term are seasonal workers, the employer is not considered to employ more than 50 full-time employees (including FTE’s) and the employer is not an applicable large employer for the current calendar year…. The four calendar months and the 120 days are not required to be consecutive." The seasonal worker definition applies to employers, such as municipalities and park districts, that hire college and high school students for summer jobs as pool lifeguards and grounds maintenance. If these seasonal employees work four months or less, and their presence on the payroll tips the balance as to large employer status by causing the employer to exceed 50 FTE employees on a year-round average basis, then the seasonal worker exception may make the difference between large employer status and non-large employer status for ACA purposes. Public employers who use seasonal employees, especially in large numbers in comparison to the number of year-around employees, should use the seasonal worker calculation during 2014 to determine large employer status for 2015. If there are questions concerning the calculation and whether it tips the balance one way or the other, please feel free to contact us by telephone or e-mail. On August 1, 2013, Fashion Outlets Chicago opened its doors for business in Rosemont. The new high-end shopping center – the first indoor mall to be built in Chicagoland in over 10 years – boasts over a half million square feet of retail and restaurant space, and cost $230 million to build. The developer, Florida-based AWE Talisman, successfully leased over 95% of the space before the mall opened, and estimates that the mall will generate nearly 2,000 jobs. The mall’s opening all but guarantees an economic boon for the Village of Rosemont, who partnered closely with AWE Talisman to make the mall a reality. Rosemont provided the developer $50 million in grants and tax breaks to build the mall, which is located in a tax increment financing ("TIF") district. Rosemont also contributed roughly $15 million to construct the Balmoral Avenue tollway exit, which feeds directly into the mall. Further proving that everything must go, the village picked up the tab for all drivers passing through the Balmoral Ave tollbooth between August 1 and August 4 between 9 a.m. and 8 p.m. On a normal day, 6,000 cars use the Balmoral Ave exit, with each car paying between $0.80 and $1.60 in tolls. Although the exact number of vehicles exiting during the mall’s grand opening has yet to be determined, Illinois Tollway authorities estimate that Rosemont may have paid more than $50,000 in tolls over the weekend. This isn’t Rosemont’s first foray into public-private partnerships, either. In 2012, the village helped finance MB Financial Park, a 120,000 square foot outdoor entertainment district located immediately north of the mall that features a movie theater, bowling alley, restaurants and bars. Between the mall and the financial park, Rosemont has taken a very active role in retooling its tax base. So, what, you may ask, does Rosemont get for opening its checkbook to support these private enterprises? It is estimated that the village will receive $6 million annually in tax revenue from the mall. Stated differently, it will take the village just over three days to recoup the $50,000 in free tolls it provided during the mall’s opening weekend. In all likelihood, opening weekend paid for itself. This adept economic development strategy has been used before. When the Aurora Premium Outlets opened in 2004, the developer – not the City of Aurora – paid for all tolls at the I-88 Farnsworth Avenue exit for two weekends. Rosemont certainly upped the ante by funding the tolls with taxpayer dollars, but this short term expense may very well generate significant long term revenue for the village’s general fund. A reporter had requested numerous documents under FOIA relating to the resignation of three university coaches in relation to an alleged assault of a student and subsequent settlement payment. The university released some of the records, and redacted or withheld certain records based on a variety of exemptions, including the personal privacy exemption, deliberative process exemption, and the Family Educational Rights and Privacy Act. The reporter filed suit, claiming that the university violated FOIA. The trial court reviewed the documents in camera, and concluded that most of the documents were properly withheld or redacted, but ordered certain records released. Although the university released these records, the reporter appealed the remainder of the court's ruling to the appellate court. For the most part, the appellate court agreed that most of the records were exempt from release, but did order the release of three additional records. State Journal-Register v. University of Illinois Springfield, 2013 IL App (4th) 120881. What is interesting about this particular case is the detailed analysis the appellate court went through in applying each of the three claimed exemptions. The court's analysis will be particularly helpful to public bodies in determining whether or not the personal privacy or deliberative process exemption applies to a particular record. For example, with respect to the "deliberative process" (or draft documents exemption) under Section 7(1)(f), the court first acknowledged that the purpose of this exemption was "to protect the communication process and encourage frank and open discussion among agency employees before a final decision is made." Otherwise, the court noted that employees and officials may "temper candor with a concern for appearances and for their own interests to the detriment of the decisionmaking process." In determining whether this particular exemption applies, a public body must separate purely factual material from the deliberative, predecisional discussions. That factual material must be disclosed once the final decision is made unless it is inextricably intertwined with the exempt discussions. In applying this exemption to the requested materials, the court held that e-mail strings containing staff opinions and general communications of the incident or scheduling of meetings during the investigation were exempt as the administrators collected information to guide in reaching a decision as to whether misconduct occurred. Witness statements, however, were not exempt under this exemption because the contained factual allegations (the court did find these statements exempt under the personal privacy exemption). The final decision on the investigation was also not exempt. The court first stated that information contained within a personnel file is general exempt from disclosure for personal privacy reasons unless it bears on the public duties of public employees and officials. Applying that exemption to the requested records, the court determined that records reflecting the coaches' compensation for accrued vacation and sick time, employee status, and other related documents were exempt under the privacy exemption, stating "[w]e fail to see how the coaches' election for the disbursement of accrued vacation, sick leave, and related documents have any bearing on their alleged misdeeds or public duties." The court distinguished a 2008 decision (Stern v. Wheaton-Warrenville Community Unit S.D. 200) that required the release of a school superintendent's contract. With respect to the witness statements, as noted above, the court applied the balancing test, finding that although the public has an interest in the disclosure of these records, the witnesses' right to privacy outweighed that interest. Since the newspaper had already written numerous stories about the incident informing the public about the incident, and because the details of the sexual misconduct in the statements were highly personal, the court determined that the records were protected. As to the unredacted settlement agreement, the court determined that a copy of the settlement had already been released, redacted to protect the student's name. The court determined that the redaction was proper to protect the victim's identity. The Educational Privacy Act, a federal law, prohibits the release of education records, or personally identifiable information contained in those records) of students without the written consent of the students' parents. Education records are defined as records, files, documents, or other materials that contain information directly related to a student and that are maintained by the educational institution. In applying this law to the requested records that did not fall under one of the above FOIA exemptions, the court determined that the law did not protect records referencing the final decision, the coaches' statements, or a student's complaint, so long as the complaint was redacted to remove the student's name. As a result of this very detailed and comprehensive analysis, the court determined that the university must release a redacted student complaint, correspondence relating to the final decision, and the coaches' statements. On August 2, 2013, the Seventh Circuit Court of Appeals ruled that an assistant state’s attorney (ASA) was entitled to First Amendment protection when he testified against his supervisor, the McHenry County States Attorney, pursuant to a subpoena, in front of a grand jury and at the supervisor's criminal misconduct trial. Chrzanowski v. Bianchi, No. 12-2811, 2013 WL 3958456, at *1 (7th Cir. Aug. 2, 2013). The ASA filed suit against the States Attorney (his supervisor), claiming that his First Amendment rights and his rights under various state statutes had been violated when his supervisor interrogated him and eventually fired him in retaliation for his testimony. The supervisor moved to dismiss the Section 1983 claims, arguing that the ASA's testimony was given as a part of his official duties and, therefore, the First Amendment’s protections did not apply. The district court agreed and held that the ASA had not presented a valid constitutional claim and, even if he had, the supervisor would likely be entitled to qualified immunity. The ASA appealed and the Seventh Circuit reversed. The Seventh Circuit reasoned that the district court’s conclusion placed weight on an excessively broad job description and failed to assess what tasks the ASA was paid to perform in the course of his daily professional activities. The court determined that as an ASA assigned to a felony trial courtroom, he was employed to prosecute felonies by engaging in a range of expressive activity, but that he was not employed to witness criminal wrongdoing and then testify about it. As a result, the ASA's testimony was made outside his official duties and entitled to First Amendment protection. The court also stated that a public employee speaks as a citizen when he gives testimony pursuant to a subpoena because he is fulfilling the general obligation of every citizen to appear before a grand jury or at trial. Finally, the court briefly addressed the qualified immunity argument advanced by the district court and concluded that reasonable officials, such as the supervisor, would understand that retaliating against an employee for giving grand jury and trial testimony would violate the First Amendment. The Illinois Appellate Court recently issued an opinion, holding that a former police offer was entitled to two separate cost-of-living increases under the Illinois Pension Code. Gutraj v. Board of Trustees of the Police Pension Fund of the Village of Grayslake, Illinois, 2013 IL App (2d) 121163, (Ill.App.Ct. 2013). In 2000, the officer suffered a heart attack while in the line of duty, which caused him to be unable to return to work as a police officer. Later that same year, the Board of Trustees of the Police Pension Fund awarded the officer a "line of duty" disability pension. The following year, in 2001, the officer began receiving an annual noncompounded 3% increase to his pension, pursuant to an amendment to Section 3-114.1 of the Illinois Pension Code. The officer then turned 60 years old in 2011 and demanded an additional 3% increase to his pension, pursuant to Section 3-111.1(c) of the Code, which provides for the monthly pension to increase by 3% after the claimant reaches the age of 60. The Board refused to pay the additional 3% increase, and argued that the officer was not entitled to increases under both sections of the Code. The officer then filed suit against the Pension Board. After reviewing both Sections 3-114.1 and 3-111.1(c), the trial court determined that each section unambiguously provided for separate, annual increases to pension benefits. The court pointed out that each increase was limited by narrowly tailored prerequisites, of which the officer met for both sections. The Board then appealed to the appellate court, arguing that Sections 3-114.1 and 3-111.1(c) were "mutually exclusive" based on the absence of such language. Additionally, the Board argued that the ambiguity of each section required the board to look to legislative intent. Upon review of both sections of the Code, the Illinois Appellate Court affirmed the trial court ruling in favor of the officer. The court determined that the plain language of the statute was clear and unambiguous. The court found that each section set forth two distinct benefits, which required different criteria to be met. Further, the Appellate Court disagreed with the Board’s argument regarding "mutually exclusive" language, finding that both sections of the Code were unambiguous. The Civic Leadership Academy (CLA), sponsored by the Center for Governmental Studies (CGS) at Northern Illinois University is a leadership skills development program designed for elected and appointed leaders and managers in government, nonprofit, and businesses working with government entities. CGS is hosting a special series of evening workshops at the NIU Rockford Center from 7:00 PM - 9:00 PM, beginning in September and ending in early November. This series of six workshops, led by attorneys from the law firm of Ancel Glink, has been crafted for new and incumbent local government officials and civic leaders. Registration is open, and the cost of each workshop is $49.00 per person. September 4, 2013, 7:00 – 9:00 p.m. This session will survey the differences in the different forms of municipal government (e.g., home rule/non-home rule, manager form of government, and commission form of government) and the different powers and responsibilities that go along with each for the executive (Mayor or President) and the legislative (aldermen, commissioners, or trustees) officials. We will explore the relationship of various officers and directors and staff with the elected body and the roles and responsibilities of each elected official in the typical matters of public business. September 18, 2013, 7:00 – 9:00 p.m.
Transparency in government is more than just a buzz word - it is the law. In this session, you will learn about the Illinois "sunshine laws" (Open Meetings Act and Freedom of Information Act) and how these laws affect local governments, officials, and employees. The session will also explore some of the legal pitfalls in the use of technology (emails, text messages, and social networking) by local government officials and employees, and how to address, and hopefully avoid, these issues. October 2, 2013, 7:00 - 9:00 p.m. If you are like many newly elected officials, one of your first acts in office was to approve a multi-million dollar budget with only a brief opportunity to grasp the scope and contents of the document. And that was just the beginning. Other financial documents require your attention, including the Audit, Annual Treasurer's Report, the tax levy, and more. This seminar will explain all the mandatory annual financial documents a public official will review and approve during one fiscal year. In addition, you will learn how the tax cap works to limit the amount of property taxes your community can collect and how you can maximize your municipality's flexibility to spend tax revenues. Finally, a brief overview of the economic development tools available to municipal officials will be presented. October 23, 2013, 7:00 – 9:00 p.m.
Regulation of land use is a basic and essential function of local government. Because land use law is drawn from constitutional principles of due process and statutory limitations of local government authority, it is critical that local officials have an understanding of their power and responsibilities. In addition, local officials want to see their communities thrive and grow. Understanding the statutory tools available for economic development will help leaders facilitate the growth and development of their communities. November 6, 2013, 7:00 – 9:00 p.m. This session will provide an overview of applicable federal and state employment laws which newly elected officials will need to be aware of when dealing with personnel matters. We will discuss the Fair Labor Standards Act, the Americans with Disabilities Act, the Family Medical Leave Act, the Illinois Minimum Wage Law, and the Illinois Wage Payment and Collection Act among others. A brief overview of Title VII actions will also be provided. Finally, we will discuss how to deal with labor issues that arise in a union environment. On August 1, 2013, Governor Quinn signed Ill. H.B. 1 and, effective January 1, 2014, Illinois will join 18 other states and the District of Columbia in allowing for the medical use and cultivation of cannabis. As we previously reported, this legislation will establish up to 22 cultivation centers (one for each Illinois State Police district), and up to 60 dispensaries “geographically dispersed throughout the State . . . .” The law imposes distance requirements for cultivation centers (2,500 feet) and dispensing organizations (1,000 feet) from the property line of any pre-existing public or private preschool, elementary, or secondary school, day care home or center, or part day child care facility. Cultivation centers must also be located 2,500 feet from any area zoned for residential use, and dispensaries are prohibited in houses, apartments, condominiums, or any residentially zoned area. Some home rule and non-home rule local government regulations are preempted by this legislation, but local governments may still enact reasonable zoning ordinances regulating cultivation centers and dispensaries that do not conflict with the Act or its administrative rules. Therefore, a municipality should be able to zone cultivation centers and dispensaries, both by identifying the appropriate (or inappropriate) zoning districts for such uses, as well as determining whether these uses should be permitted by-right or require a special use permit in the defined zoning districts. A municipality should also be permitted to impose reasonable conditions on any special use permit to mitigate the impacts, just as it does for other special uses. Likewise, it would seem reasonable to prohibit dispensaries and cultivation centers in certain zoning districts. The Act also provides that communities may not “unreasonably prohibit the cultivation, dispensing, and use of medical cannabis authorized by this Act.” Therefore, an outright ban on all cultivation centers and dispensaries, would probably have to be supported by findings of fact that there is a rational basis for banning these uses from a particular community (e.g., unique character). For example, a local zoning ordinance prohibiting cultivation centers or dispensaries simply because the use may violate federal law (e.g., the federal Controlled Substances Act) would likely be invalid under the new Illinois law. Ter Beek v. City of Wyoming, 297 Mich. App. 446, 450, 823 N.W.2d 864, 866 (2012)(finding preemption under Michigan Medical Marijuana Act). Finally, a local government will have to establish a rational basis for prohibitions on medical marijuana use in locations other than those locations prohibited by the Act. Those locations include schools, school buses, motor vehicles, private residences used to provide licensed child care, and public places. A “public place” does not include hospitals, nursing homes, hospice care centers, long-term care facilities, and most private residences.